A black and white photograph of Dorothy Marie Donald (1942-2002) and others in the preschool class. Two rows of children. Dorothy is on the bottom row the 4th child from the left of the photo. Dorothy was born in Toronto in 1942 to Charles Henry Donald (1905-1976) and his wife Glady-Marie O'Donnell (1907-1986). Harry Donald was a Whitby travel agent and former car dealer. Harry Donald Garage was located at 300 Dundas Street East, Whitby, Ontario from 1937 to 1966. There was also a car lot on the other side of Dundas Street opposite the garage. 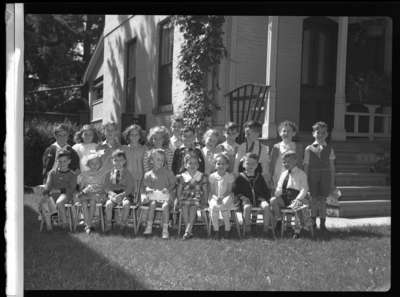 Dorothy Donald and preschool class (Image 1 of 3), 1946, Marjorie Ruddy. Whitby Archives A2013_040_1060.